The galaxy in this picture is Centaurus A, but it's being upstaged in its own cosmic neighborhood. Its central black hole is emitting jets that are a million light-years long...and this is our best look yet at this mysterious phenomenon. These lobes are filled with matter streaming from particle jets near the galaxy's central black hole. Astronomers estimate that matter near the base of these jets races outward at about one-third the speed of light. The enormous energy output of galaxies like Cen A comes from gas falling toward a black hole weighing millions of times the sun's mass. Through processes not fully understood, some of this infalling matter is ejected in opposing jets at a substantial fraction of the speed of light. Detailed views of the jet's structure will help astronomers determine how they form. The jets strongly interact with surrounding gas, at times possibly changing a galaxy's rate of star formation. 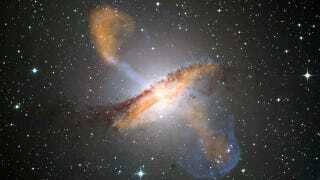 Jets play an important but poorly understood role in the formation and evolution of galaxies. And here's a close-up of the jets themselves, which offers never before seen detail of the light-year of the jet that's closest to the black hole. This particular image was created in radio light by the TANAMI project, which used nine telescopes from continents throughout the southern hemisphere to focus in on the innermost region of the jet. The composite image up top is a mixture of visible, X-ray, and microwave light, with the X-ray light appearing blue and the microwave appearing orange. Finally, here's a NASA video showing of some of the amazing new details about these jets.